When companies and organisations put ethical values at the heart of what they do, something extra-ordinary happens - purpose takes centre stage. This unleashes untapped potential within an organisation and ensures the wellbeing of people and the planet. 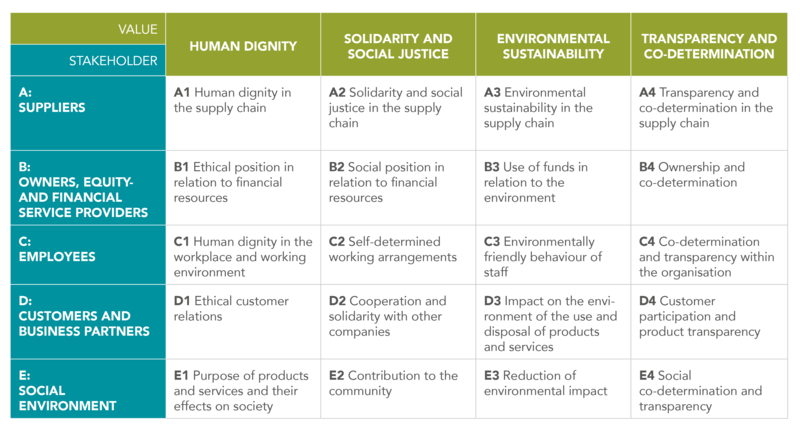 The Economy for the Common Good (ECG) framework is a comprehensive management tool which empowers organisations to find their true purpose and make a meaningful contribution to society. The course also forms the basis for becoming a certified ECG Consultant. The Economy for the Common Good (ECG) is a global movement that is creating an alternative economic system built on values that help people thrive and live a good life. We are building an economy that increases the wellbeing for all and which protects our environment for future generations. ECG is a model for economic, political, and social change which embeds human values into the very core of business entities. Financial profits become a means, rather than the only goal. This ensures all stakeholders benefit from the business activity. What is the Common Good Balance Sheet? The Common Good Balance Sheet sits at the heart of ECG. It is based on the Common Good Matrix , which allows a systematic examination of all activities from every angle. Gerd Hofielen M.A., is an economist and psychologist. Consultant for organisational development, humanistic foundations of business models and ethical business practices. He is a certified ECG consultant. He works in the ECG Matrix Development Team and is a member of the steering committee in the local ECG chapter in Berlin, Germany. Nils Wittke M.A., is an engineer and landscape architect. He has worked in the leadership team of an international furniture retail company where he was the manager for corporate social responsibility. Now he is in his own firm as consultant for sustainability and business transformation. He is also a certified ECG consultant and auditor. There are hotels and BnB accommodation nearby. Investing in the community - The Albany, which manages the Canada Water venue, generates 60% of its own income and every penny it makes gets reinvested into its programme and buildings.